Our roads are filled with overworked, underslept, drunk, distracted drivers. Jalopnik readers have ten tips for dealing with them. 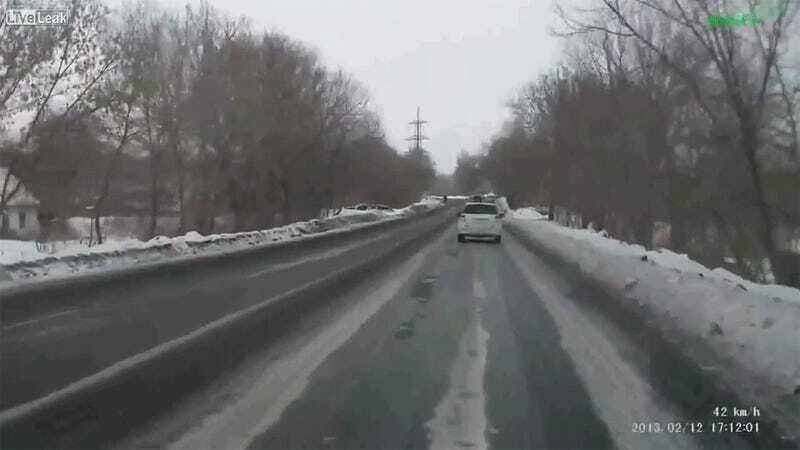 There are all kinds of wrong ways to deal with bad drivers. You can honk impatiently at people holding you up at a green light. You can swerve at people who just cut you off. You can yell and scream and pull out a gun if you're in Russia. These are all bad plans. First of all, going full road rage on a person is not going to end well for anybody (this guy who did indeed pull a gun on another driver nearly lost his own car). Second of all, the stress of combating a bad driver is never worth it. And that's why we have these ten tips for dealing with the terribleness we deal with on a daily basis. If you have any more strategies, let us know in Kinja below. When someone cuts you off, it might seem like a good idea to lay on your newly installed 120 decibel foghorn, or try and swerve at them repeatedly to get them out of your lane. This usually ends up in something very expensive happening, like a hospital trip when the offender turns out to be a ‘roid rage pro-wrestling reject. Just stay calm. It’s called predictive driving – when you see someone swerving around cars, or if you just got cut off by a guy on his cell phone who is also somehow eating a pulled pork sandwich, just give them room. Let them get into their own accident down the road, away from you. One of the most annoying things that can happen on the highway is to get stuck behind a left lane hog. Reader duurtlang comes from a country where passing on the right is illegal, and it’s refreshing to see a world without undertakers. I just stay behind them. When there's ample room on the right I move to the right, but won't pass. I just stay right behind him so I'm constantly in his right mirror. I move back left when traffic forces me to. I do tend to keep a shorter distance if they don't move right when they easily can, long enough for not being incredibly dangerous but short enough for him to notice I want to pass. It almost always works. No flashing lights, and no honking. Here in America, tons of self-possessed drivers clog the left lane REFUSING TO GET OUT OF THE WAY OF ANY OTHER DRIVER, no matter how many cars line up behind them. The least offensive etiquette is to flash twice, wait, and then make a quick pass on the right. It’s not ideal, but it works. Don’t brake check on the highway, people. Either the red light runner doesn’t realize it’s a red light and a honk will zone them back into reality, or they’re a total dickbag deserving a honk. It’s a lot easier to hit the gym or run when you get home, rather than try to hit some other dirtbag driver and go Nascar banging on the highway. In fact, you might as well avoid the highway altogether. Take the smaller service roads, so you don’t have to deal with tired, distracted drivers at 80 miles an hour. Why flip people off? Give ‘em a thumbs up instead. A huge smile perplexes and disturbs the small brain of the average terrible driver more than a middle finger ever could.